Scandinavian Adventure, Norway and Sweden 2019. If you are a Minnesotan or a midwesterner, chances are that in addition to your Swedish heritage you also have a Norwegian background. Our Tour of Scandinavia is for anyone that wants to enjoy the beauty of Norway and Sweden, with a 3-day post trip package for those who are searching for their family origins in Sweden. Welcome to Norway, and Bergen, the gateway to the fjords! Arrival to Bergen Airport, with pick-up and transfer to Clarion Admiral Hotel in Bergen. Afternoon tour of city and medieval Hanseatic wharf, followed by a ride on Funicular to top of Mount Floyen for a drink and a spectacular view of the city below. Evening group welcome dinner at Bergen harbour. Morning: Breakfast in hotel in Bergen. Bus ride to ancient Viking fjord settlement of Gudvangen. Gudvangen is an old Viking village on the UNESCO World Heritage listed Nærøyfjord. Afternoon: A breathtaking 2.5 hour afternoon fjord cruise from Gudvangen through Nærøyfjord and Auerlandsfjord to Flåm. The small village of Flåm is located at the innermost bank of the Aurlandsfjord, surrounded by steep mountains, thundering waterfalls and narrow valleys. Upon arrival to Flåm, check-in at Fretheim hotel, where the bus has transported our luggage. Dinner on your own in Flåm. Morning: After breakfast at Fretheim hotel, we will check out to start our journey on the Flåm Mountain Railway. The Flåm Railway was named the world’s most incredible train journey by Lonely Planet in 2014. The journey takes you from Flåm by the fjord to the top of the mountains, and during the 12-mile train ride you can see rivers cutting through deep ravines, waterfalls cascading down the sides of steep, snow-capped mountains and mountain farms clinging dizzily to steep hillsides. Afternoon and evening: In the afternoon we travel by bus through more breathtaking scenery to Oslo, then check in at Clarion Hotel Bastion Oslo. Early evening, we will tour the medieval Akershus Fortress, then dinner on your own at the many restaurants in Oslo Akersbrygga wharf. Morning: After breakfast at Clarion Hotel Bastion in Oslo, we will go on a walking tour of Oslo in morning, followed by bus ride to Oslo Viking Ship museum where we will see the world’s best-preserved Viking ships up close! Rest of day: Enjoy time on your own in Oslo! You might enjoy the KonTiki museum, the Edvard Munch museum, or shopping and exploring the city on your own. Day 5 - Welcome to Sweden! Morning: After breakfast we will check out of Clarion Hotel Bastion in Oslo. Afternoon and evening: Welcome to Sweden! We have a land travel day on bus to Sweden with a stop in Karlskoga for a leg stretch and a guided tour of the Alfred Nobel Museum, and where you can buy a sandwich or snack at the museum cafe. Later in the afternoon we arrive in Sigtuna, a charming thousand-year old town and the very first capital of Sweden. After checking into our hotel at the Sigtuna Foundation, we will enjoy a Welcome to Sweden group dinner at the hotel. Morning: Breakfast and guided tour of Sigtuna, founded by Viking King Erik the Victorious in the year 970. The oldest still-occupied Viking city in Sweden, with hundreds of Viking runestones and ruins of the three first Christian churches in Sweden from the period 1000-1100 AD. We will stroll along the 1000-year-old main street and see the beauty and charm of this town throughout the centuries. Lunch on your own in Sigtuna. Afternoon: Bus ride to Uppsala, the university city 30 kilometers north of Sigtuna. Visit to the massive, majestic ancient burial mounds of Viking Kings and the site of the old Norse temple in Old Uppsala and museum interpretive center, followed by a tour of the largest Scandinavian cathedral in modern Uppsala. Dinner on your own in Uppsala. Morning: Breakfast and check-out of Sigtuna Stadshotell. Bus ride to Stockholm, the Capital of Scandinavia, 45 miles south of Sigtuna. Panoramic bus tour of the city with photo stops. Stockholm is also known as Beauty on Water, or The Venice of the North as it is composed of 14 islands between the Baltic sea and a freshwater lake. Check in to Clarion Hotel Sign or Scandic Grand Central hotel in the city center. Afternoon: We will explore the charms of Old Town island, the oldest medieval part of the center of Stockholm. Guided walking tour with traditional Swedish Fika – coffee in an 11th century vaulted cellar. Evening: Group Viking-themed dinner at Airfur in Old Town. Drink lots of mead, or other traditional Viking alcoholic drinks at your own risk! Viking style music, dancing and entertainment with traditional Viking food. Morning: Our second day in Stockholm starts with a visit to UNESCO World Heritage Sites Drottningholm Palace and the Drottningholm Court theater from the 17th century, the only original theater in the world from that time period. Group lunch at restaurant on the Palace grounds. Drottningholm Palace is the residence of Their Majesties King Carl XVI Gustav and Queen Silvia of Sweden. Afternoon: Guided tour of the Wasa Ship museum, a must-see for anyone coming to Stockholm. 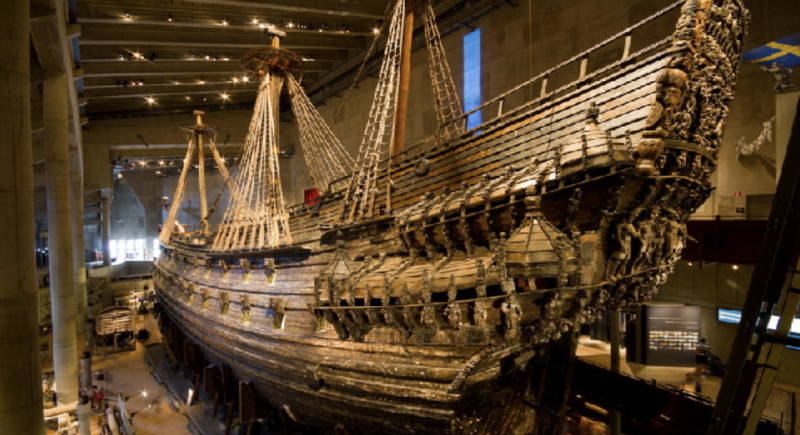 A regal warship from 1628 that sank thirty minutes into her maiden voyage, spent 333 years under the waters of Stockholm and was re-discovered and raised in 1961, and is unbelievably 95% intact! The most visited attraction in all of Scandinavia. After the Wasa Ship tour, we proceed on foot to the ABBA museum, where you walk in and come dancing out! Three of the four members of ABBA live in Stockholm and like to visit their museum, who knows who we might meet! Evening: Time to get a taste of the Nordic cold – we will kick-off with a drink in the Icebar! Get suited up in special parkas and mittens and step into the crystal clear -7-degree atmosphere surrounded by the same original ice sculptures as found in the Swedish Ice hotel above the arctic circle. Enjoy a vodka-lingonberry drink served in a glass of ice. Rest of evening free to explore Stockholm by night! We recommend dinner and shopping. Day 9 - Day at sea! We board a boat and cruise around the unique and naturally beautiful Swedish archipelago with 30,000 islands on the Swedish eastern coastline, with island stops for lunch and a special surprise. We will visit the island of Sandhamn, a very picturesque village and we can look out over the Baltic Sea. Evening: Our farewell group dinner at the hotel Clarion Sign. We enjoy one final breakfast together in the Clarion Sign hotel restaurant and proceed to check out and bus transfer to the airport. A personable and friendly driver in the mountains, fjords and cities. Private coach including Wifi, lavatory and refrigerator with bottled water. Transfers to and from airports in Bergen and Stockholm. All hotels in city/town centers. Single occupancy incurs extra charges. Bergen funicular ride, Viking village Gudvangen, Fjord cruise Gudvangen – Flåm, Mountain Railway Flåm, Åkershus Fortress tour. Viking Ship museum Oslo, Nobel Museum Karlskoga, Old Uppsala interpretive center, Drottningholm Palace and Court Theater, Wasa Ship Museum, ABBA museum. Archipelago boat cruise and Ice Bar. If you are a Minnesotan or a midwesterner, chances are that in addition to your Swedish heritage you also have a Norwegian background.